veganmofo 2: Vegan Cookies Invade Your Cookie Jar | Go Fork Go! Alright, I promise this post will be shorter than the tofu post. I feel like I wrote a frickin’ novel on tofu. I love Isa’s books. I have v-con, VWAV and VCTOTW. The ones I don’t own are vegan brunch (which I have borrowed from the library but I don’t eat brunch all that often) and the cookie book! I have also never baked a vegan cookie before. I have been tempted to try but baking cookies leads to eating cookies leads to putting on weight. More importantly, I’m pretty sure that every cookie I’ve ever baked in my life has required eggs. 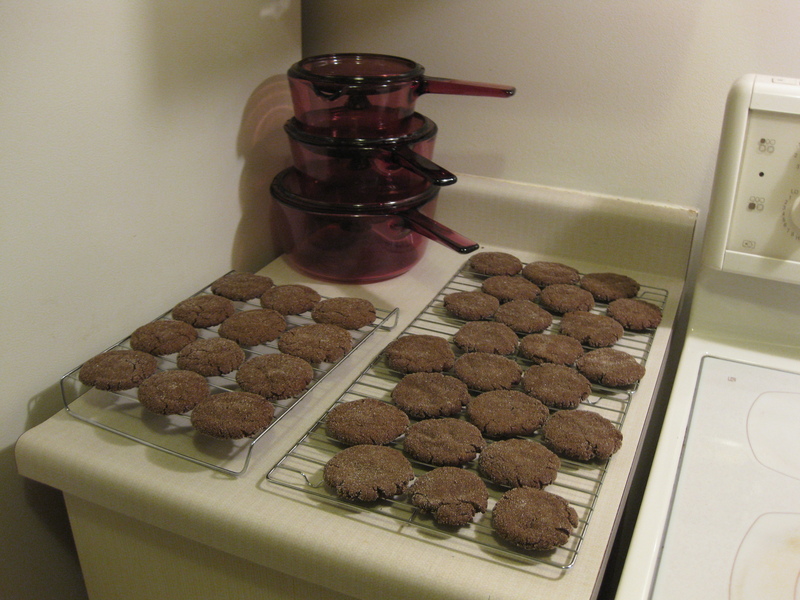 However, the recipe for Mexican Hot Chocolate Snickerdoodles is posted on the ppk website and I wanted to make cookies to bring over to a friend’s house. Do you like my stack of pots? Right, cookies. The cookies turned out pretty well. They are a bit dry on the edges but the centers are soft and amazing. There is just that right level of cayenne pepper kick too. What I would change if I made these cookies again: roll them thinner and maybe use a rolling pin rather than my palms and bake them for 8 mins rather than 10 so that they will be chewy all the way around rather than crispy since the crispy is more of a dry crispy. Now I just need to find a recipe to replicate my favourite oatmeal raisin cookies. On the other hand, it might be better if I didn’t. And I should probably think about buying VCIYCJ… although I’d probably need to double my mileage or something to run all of the calories off if I did. Yikes. Those cookies look yummy. I made some vegan chocolate chips cookies the other day and they were pretty good. I’m always amazed at how great “veganized” recipes taste. I friggin LOVE the Mexican Hot Choc Snickerdoodles. You’re totally right–they have just the right amount of kick, and it doesn’t come out at first. I think I made the choc chip cookies from VCIYCJ too, but much preferred the choc snickerdoodles.